North Wales dairy farmer, Gareth Roberts, of the Llaeth Y Llan-Village Dairy yoghurt business is this year’s recipient of the FUW-HSBC Bank outstanding services to Welsh dairy industry award. 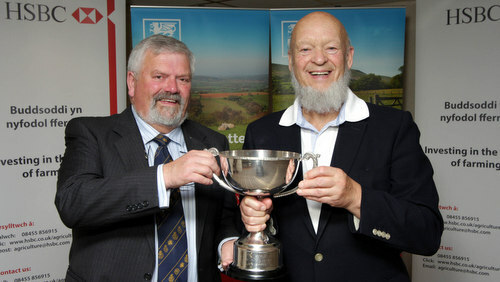 Mr Roberts, who was presented with the award at the Welsh Dairy Show by Glastonbury Festival organiser and Somerset farmer, Michael Eavis, grew up at Tal Y Bryn Farm, some one and a half miles from the small village of Llannefydd, in Denbighshire. He lost his parents at a relatively early age while farming as a tenant, but new hope came into his life with the opportunity to purchase the farm in the early and in 1977 he married his wife, Falmai. In the early 1980’s they purchased a small milk round serving the local village of Llannefydd with bottled milk, while also processing milk into skim, semi-skimmed and cream. More than 30 years ago Llaeth y Llan yoghurt was born and today the company has a workforce of over 50 people, while the day to day running of the business is being handled by the younger generation of the family. “In 1995, we developed and built a high spec manufacturing unit on the farm, which is still being used today to produce our award winning yogurt,” says Mr Roberts. Stockists include major retailers including Tesco, Morrisons, ASDA and the Co-op.